Blogger Tyler Colman scoured auctions and quizzed wine-shop clerks in pursuit of a great bottle from his birth year, 1971. Here, his advice on how to buy older vintages. At the end of the summer of 1971, vineyard workers in Piedmont labored to bring in the harvest. Around the same time in Chicago, my mother went into labor. Somehow, I never thought these two things would be linked. During that era, my parents were probably preoccupied with changing cloth diapers, watching that evening’s guest on Johnny Carson or deciding which bell-bottoms to wear; the wines of Piedmont could not have been further from their minds. And so several decades passed. 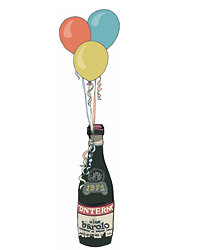 Then a reader of my Web site, DrVino.com, sent in an unusual question about birth-year wines. New parents often think about socking away some wine from their newborn’s birth year—I did myself—but this reader was wondering if I drank wine from my birth year on my birthday. Oddly, the thought had never crossed my mind. For birthdays, anniversaries and other occasions, my wife, Michelle, and I choose wines that are sentimental in other ways: wines from the year we were married, from wineries we had visited, or some of the hard-to-find wines that we had managed to squirrel away. But those were all young wines, so this was a new quest: finding a mature wine. The first problem with this task is finding out whether a wine from a given birth year is a good one; the second is determining whether it’s still drinking wonderfully. Conveniently, there are a number of resources that rate past vintages—one good one is Robert M. Parker Jr.’s vintage chart (erobertparker.com). Parker’s chart goes back only to 1970, though, so I would have had to consult a wine-collector friend, an auctioneer or Michael Broadbent’s classic book Vintage Wine if I were born before then. And while vintage charts give just a general rating for a year, books like Broadbent’s also usually estimate a life span for individual wines. It turns out that 1971 was a pretty good year in a lot of places, particularly Germany and Piedmont. In Bordeaux it was fairly strong, though not as strong as 1970, with not nearly as much produced. Checking more references, including Parker’s Bordeaux: A Consumer’s Guide to the World’s Finest Wines, I learned that Bordeaux’s Château Latour was excellent in ’71 and would likely still be drinking well. But with the 2005 Latour (not arriving until 2008) rolling in at $800 a bottle, I feared serious sticker shock. To find more names, I posted a query on the eRobertParker bulletin board and soon had suggestions for more than a dozen wines, among them Domaine de la Romanée-Conti from Burgundy, Château Climens from Sauternes, and Penfolds Grange from Australia. And Northern California had its partisans, too: After all, the 1971 Ridge Monte Bello placed fifth at the famous Paris tasting in 1976 and was the top-scoring wine at a reenactment of the tasting last year. Armed with these choices, I turned to selecting a wine. I went to Wine-searcher.com, a site that consolidates the catalogs of wine shops around the country, and found the 1971 Domaine de la Romanée-Conti La Tâche for $4,200—the end of that idea. Winezap.com and Wineaccess.com also proved fruitless. Mature German Riesling suddenly seemed much more intriguing. I floated the idea by Michelle. "What about a ’71 German Riesling?" I asked. "Why drink white when you could drink red?" she replied. Finally, I found some ’71 Latour at an upcoming auction. (Of the major wine auctioneers, Christie’s, Hart Davis Hart and Acker Merrall & Condit allow people to download catalogs from their Web sites; Sotheby’s requires registration.) The estimate was about $300 a bottle: not bad. The catch was that the Latour was part of a lot of six bottles—too much left over if I didn’t like it, and a huge bill up front. I called Acker Merrall for some advice on how to score a single bottle. They said that it was difficult to buy just one bottle at auction, so unless I wanted to buy multiple bottles of the same wine or a mixed lot containing a single bottle of the wine I was looking for, I’d do better going through their New York City retail store. This wasn’t entirely surprising—the best retail stores often buy older collections directly from their owners, or send representatives to the big auctions. At the store, a rare-wine specialist named Jason Hyde answered the phone. He said that he didn’t have a bottle of the 1971 Latour in stock, but that he did have some 1971 Giacomo Conterno Barolo. I wondered aloud whether I might be a chump, buying such old wine, given that proper storage is critical when buying older vintages. Just as with art or antiques, provenance is a crucial consideration for older wines. "This Barolo is a known quantity," Hyde replied. He explained that Acker Merrall had just acquired 10 cases of it from a private cellar in Piedmont. The wine had been there since the day it was released from the winery, he added, answering my next question before I could ask it. "It’s a really fantastic $300 wine that drinks like the $1,500 Monfortino from that vintage," he said. "It is an excellent mature-wine experience." Suddenly, the most expensive bottle of wine I would ever have bought was beginning to seem like a bargain. And as Michelle was also born in 1971, the cost was doubly justified. I told Hyde I’d drop by the store that evening. The one caveat, he said, was that although the bottle had a good fill line, it looked "like hell." (When buying older bottles, check the level of the wine in the bottle to see if any has leaked; also, sticky residue around the base of the capsule may indicate that wine had seeped out after being exposed to heat at some point.) But after 35 years in a dark, damp cellar, Hyde added, you’d want the bottle to look somewhat decrepit. Cheery thought; good thing I haven’t spent my 35 years in a 55-degree basement. Once the ancient-looking bottle was in my possession, I had to think about how and why to serve it. Our actual birthdays were nowhere in sight, and Michelle and I couldn’t stand the wait, so we opted for a romantic dinner at home. And since I remembered an article by food writer Alan Richman about the unfortunate pairing of a fabulous wine with an even more fabulous meal, which left the wine second place in his memory, we went with simple. Michelle rounded up some hard cheeses from Italy. I made a porcini risotto. We tucked our son into bed. I lit a candle. And then I opened the bottle. I decided to decant the wine—mostly to separate it from the sediment, not because it needed to breathe (vintages this old rarely need to breathe; in fact, they tend to fade slightly faster than younger wines when exposed to oxygen). I poured the brick-red wine into a decanter, careful to stop as soon as I could see bits of sediment streaming out, then poured the wine from the decanter into two crystal glasses. I took a sniff: Black cherries, tobacco, truffles and an enticing earthiness mingled in the aroma. This wine was not remotely past its peak; it was drinking beautifully. On the palate, it had a gorgeous balance between mature fruit, amazingly crisp acidity and fine, supple tannins. We drank. We ate. We reminisced. We even called my mom to complete the circle. She told me (as she does every year on my birthday) about going to the hospital on the warm, late summer day in 1971. This time, though, she also told me something that I didn’t know. After delivering me, she was given a menu to pre-order her meals for the rest of her hospital stay. But when it was time for her last dinner before going home, the menu came back to her with a big X through the meal she’d requested. Instead, the staff brought her steak and a glass of Champagne. As I hung up, it occurred to me that for my next birthday, finding a ’71 Dom Pérignon might be just the thing. Tyler Colman is a wine educator and blogger (DrVino.com).